For it was said in that timeless moment that still echoes within me there are those among us who remember deep in some part of themselves–a part that will not let them rest–the forest and the living-ness of green things. It was said that it’s time for them to come home. Time for them to journey deep into the forest that birthed them. Time for them to take up their work–the work that resides in the deepest parts of themselves. Time for them to speak for the green things, to teach their children the way of Earth. Time for humans to think in new ways. Are you one whose Dream takes hold of you? Are you one who time and again has let that Dream go — the one Dream that holds all the smaller dreams. Perhaps it is not so much a letting go, as a turning away: to tend to the literal nature of daily life. You are not making up your Dream. The Dream is speaking through you. It dwells in the deep and ancient forest within your heart. Time and again I find reasons to turn away from the Dream and Soul that shines bright with images and feeling and initiative and a wise intelligence. 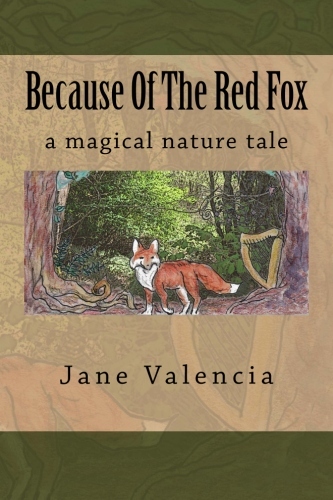 Time and again, I find a deer trail that, when I take the breath to follow it, leads through gleeful and scratchy bramble back to the dragon clearing where the trees welcome me as a very young grandchild and the stones offer me their own sweet music. The plants set about educating me, and the birds remind me that the universe is threaded in song. And the land: the earth supports and voices the Dream. 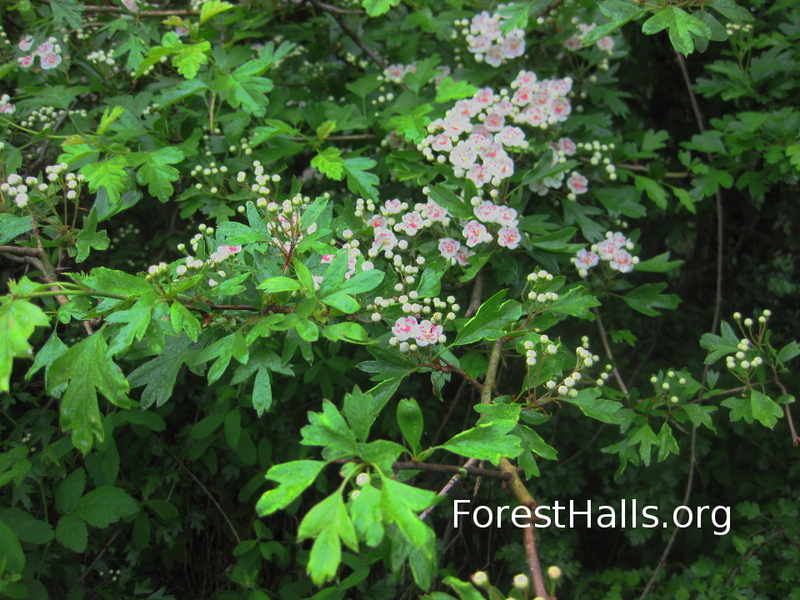 I am always finding my way back to Forest Halls, even when I have thought I never left it (until I return: then I know I’ve only been groping through the salal at the very edges, with an occasional jab in the “I” by a twig). 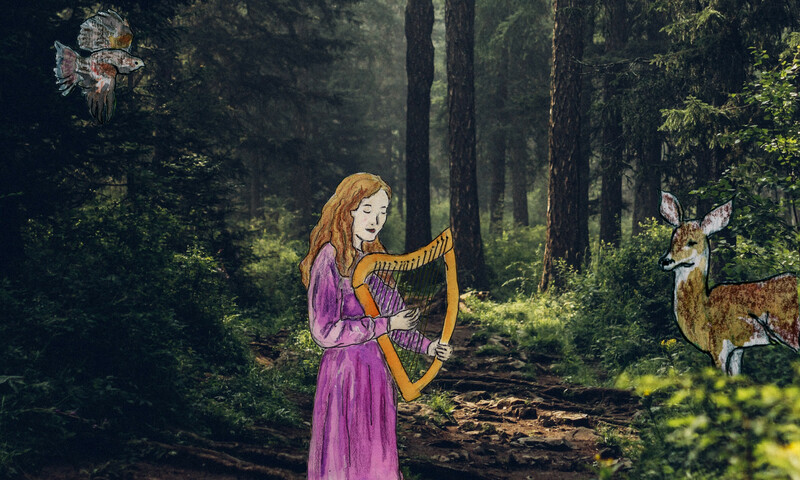 The harp is one gate-opener for me, my foremost musical partner on the journey. The trees are my generous teachers, the plants my inquisitive co-creators, and the medicine ways of all are the ropes into the wise beauty and blessing that surrounds us and lies just below where I perhaps most typically reside. There is beauty and blessing here indeed — as well as the sometimes terrifying dark that insists we choose, insists we follow the true nature of heart with eyes closed and hands and senses wide open. It insists that we decide to listen to the veriditas and learn its nature and wild poetic tongue … Decide: to listen …. or to turn away to head straight back to what we think is a place of safety. But what was once the cozy hut on the trail is in reality now a diminished and stunted expression of who we are. What suited and sheltered us at one point on the journey is not where we are meant to remain. The world is alive, and all things within it are speaking. The trail we follow through the thickets and across open meadows, over waters and into the ancient mind of the mountains is speaking to us too. Take a moment and breathe into the pattern, the weave of all that is and the grace that lies beneath nourishing all. Where do you feel the language? Where do feel the song? 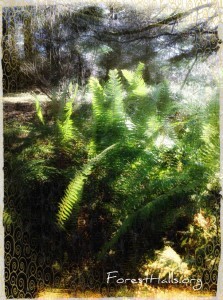 Where are you in the forest, the deep, mysterious terrain of your soul? Where are you in the salt waters of your Dreaming? Stories are welcome here. The forest is listening. Newsflash! Garden Sneaking up on Unsuspecting Harp! 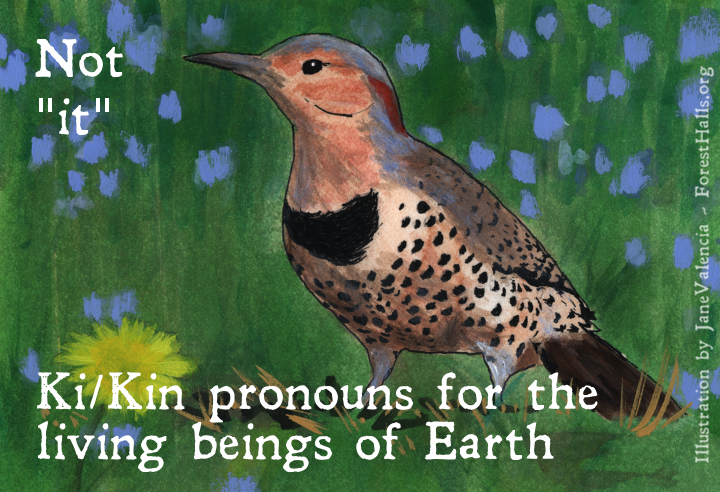 Many year ago, Dian Cecht — physician, god of healing, and member of the Tuatha De Danaan (an ancient tribe of divine folk in Ireland) — scattered his daughter Airmid’s cloak of herbs. With this action, he cast a possible comprehensive herbal tradition to the winds. As you might guess of an action initiated by rage and jealousy, unintended consequences have resulted. Herbal magic may pounce upon us at any time! It is imperative that we reassemble Airmid’s herbal cloak to prevent absolute pandemonium. PLEASE NOTE: Disagreement exists as to whether the chaos will result from feral herbs having wild garden parties in our hallowed concrete jungles, or from unconscious followers of Dian Cecht’s emotional state responding with fear and outrage to the fun and powerful healing mystery of the green beings that have been living beside us all this time. Agreement does exist that reassembling Airmid’s herbal cloak will help bring the healing ways of the herbs to one and all. This was Airmid’s original intentio, and, we presume, that of her brother the astounding healer, Miach. Describe a healing property of each one you I.D. If you are an herbalist or lover of the plants, please let us know how you are contributing to the restoration of Airmid’s herbal cloak! 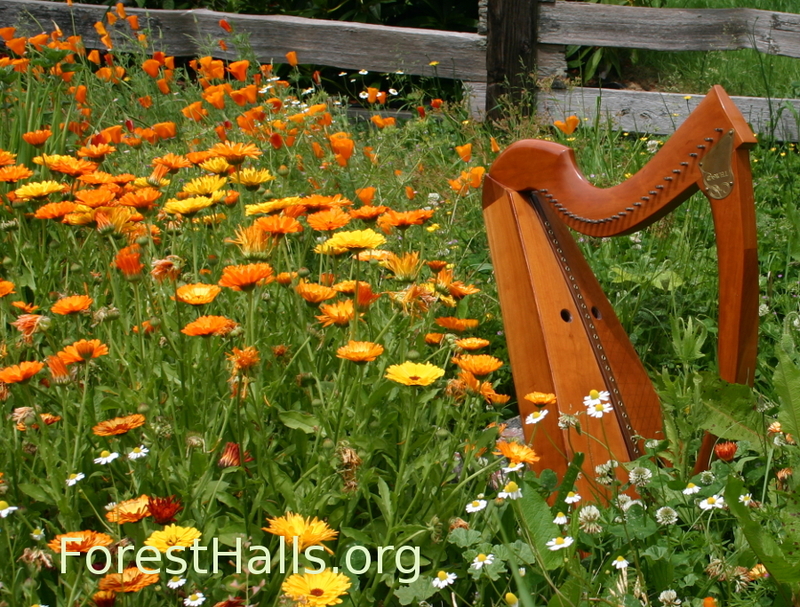 How has a harp you’ve witnessed contributed to restoring lost wisdom to your neighborhood or community at large. PLEASE NOTE: If you are a harper, you yourself may have inadverently — or deliberately — contributed in this way!!! 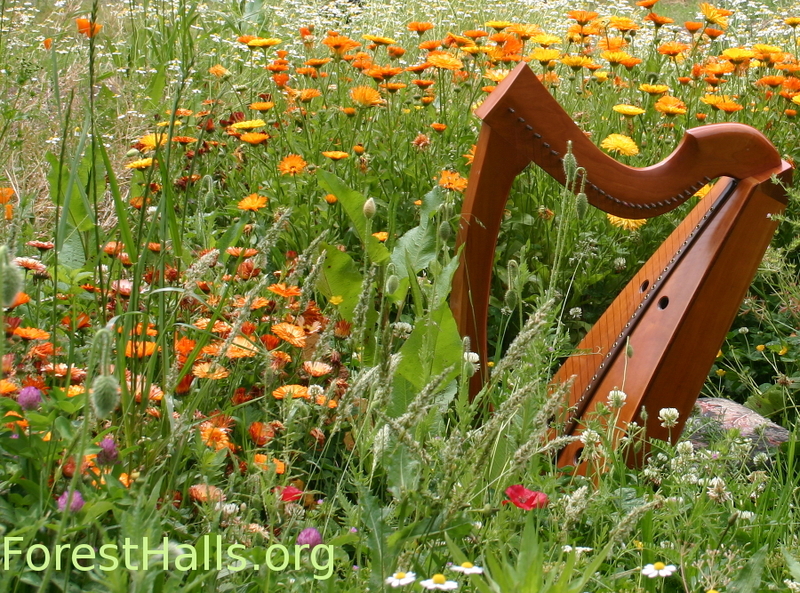 If you play an instrument, engage in a folk craft, art, or tradition, or creative expression of any kind you likely are contributing to a revitalized, intelligent, nature-allied, wise world. This is absolutely noteworthy, and we here at Forest Halls commend you for your dedication and passion. Please share with us your creative expression, and your thoughts on how it helps reweave a cloak of joyful and wise healing ways in the world. Please submit reports in the comment box below! 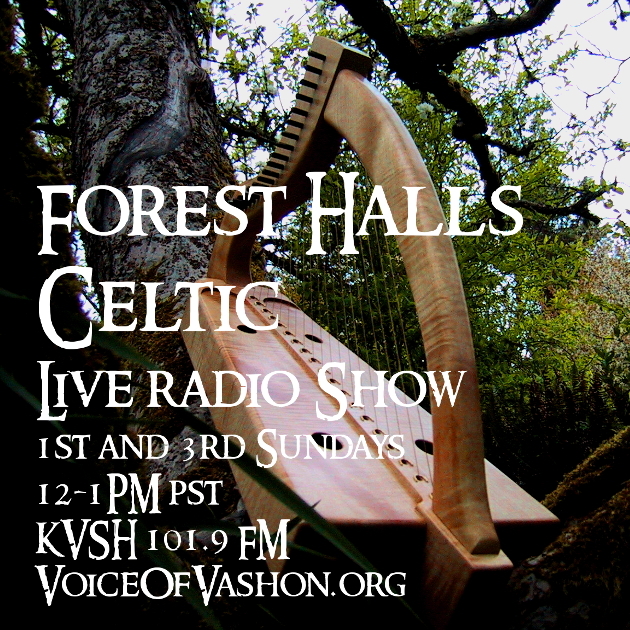 Your comments will be compiled into a Forest Halls report (blog post) that will be issued in conjunction with the next episode of Forest Halls Celtic, and given special mention there. Thank you for your important contributions to healing, peace, harmony, authenitic expression, creative imagination, and radical fun in the world!